1031 Basic Exchange Class. Learn the fundamentals of 1031 exchanges including delayed and simultaneous exchanges. 3 clock hours. Learn how a 1031 exchange works, get definitions of frequently used terms, learn about relevant tax code and hear interesting real-life stories of how 1031 exchanges have helped clients invest thousands (even hundreds of thousands) more by deferring their capital gains taxes. You'll also learn when a 1031 exchange cannot or should not be used. 3 CE credits. What Is Like Kind Property? 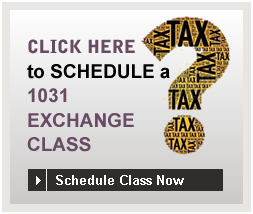 Your 1031 Exchange Basics class instructor is an experienced, 1031 exchange facilitator in your area. Click here for more information and to schedule a class in your area. Classes available in California, Nevada and Washington. © Copyright 2002 - , Xchange Solutions, Inc, All rights reserved. Website Design, Hosting and Maintenance by New Tech Web, Inc.